Left our great spot at the Green River State Park and headed for the John Wesley Powell museum in town. This is a very interesting museum chronicling the Powell expedition on the Green and Colorado River, including some first descents of “The Cataract” and other rapids in the Grand Canyon. Below are the styles of boats used to run the river years ago. An interesting fact about the Powell expedition is that there was a boat in the group that splintered in one of the rapids and the survivors were divided up amongst the remaining boats. Well after a second scary descent those men decided to take their chances with the desert above the canyon and left the expedition to hike out; never to be heard from again. The men that decided to stick with the expedition made it safely out. Might be a lesson in that. Leaving Green River, Utah we hopped on I-70 to make time toward eastern Utah, Canyonlands NP, Arches NP and Moab. Now Moab is a mountain biker’s dream destination and I had been anticipating visiting this Mecca for years and riding some of the famed trails. Well, as most things that get a lot of hype, it ain’t all it’s cracked up to be…..at least in my opinion. To begin with, as we threaded our way south on US-191 we encountered some threatening skies. A few minutes later all heck broke lose…..strong wind, sideways rain, thunder, lightning, and very limited visibility. We were able to pull off a side road and park the trailer in the lee of a large bluff. Apparently others thought that was a great idea as the small lot became quite crowded. After about a half an hour the wind died down and the rain let up so we continued on into Moab. By the time we rolled into town the storm had passed and blue skies once again were the order of the day. Moab is the typical outdoor destination town. On any weekend, such as today, it is crowded and prices are likely to be high. The few mountain bike trails that I spotted from town looked to be well worn and had a lot of riders on them. We stopped in at the visitor’s center in town to check for campsite availability. Everything was full in both National Parks…..what the heck is going on? Oh yea, it’s the weekend, drat! So relegating ourselves to a commercial campground we parked the truck and trailer along the main drag and checked a few out. They were small, tight, crowded, overly priced and…..full! So we decided to walk the main drag and check out some bike and souvenir shops. At Moab Cyclery I asked about any “Old Guy” trails. His response was that most of the local trails were in bad shape due to all the recent rain. He also informed me that the famed Slickrock Trail, even though on sandstone was, well….slick when wet. I later learned that those trails are also used by off road motorcyclist and 4X4 folks as well. Contemplating what to do, Kit and I had a late lunch at the Moab Diner where I discovered a local brew…..“Polygamy Beer” and its slogan…..“So good you’ll want to take some home to your wives”. A bit of Utah humor in that. After lunch we walked around some more and decided it was best to save Moab for another time when the weather might be better and the trails not so crowded. I guess I’m beyond putting up with all that insanity just to say I rode Moab. To punctuate our decision, this is what we encountered as we were heading back to I-70. More rain and wind and this time…..hail! I guess you could say “All hail broke loose”. We drove out of the storm in about an hour and continued on into Grand Junction, Colorado pulling into a very nice private campground. Left Grand Junction early for our anticipated transit of the Rockies. Followed the swollen Colorado River up into the mountains toward Vail. There appeared to be a walking trail/bike path along much of the river….nice touch! Topped out at Vail Pass which sits at 10,603 feet elevation and pulled over in a rest area. There were lots of snowmobile’s, skiers and folks on snowshoes in the mountains. Now, let’s see…..did I remember to bring my backcountry skies, or maybe my snowshoes? Nooooo….In January, when we left I was trying to get as far away from snow as possible. Today would have been a great day to get out and play in the snow however. Dropping down the eastern slope we encountered some snow flurries but nothing was sticking as it was 43 degrees. Traveling north of Denver we decided to pull over in a large parking lot for lunch. Doing my customary walk around the rig a few times to stretch my legs and visually check everything out I noticed the hitch ball had rotated about a quarter turn. The 1 ¾ inch nut that secures the hitch ball appeared to be tight so I scribed a witness mark on the hitch ball flange and hitch to monitor any possible movement. Sure enough, when we stopped for gas a few hours later the ball had rotated again so we made it for the nearest campground in Limon Colorado. Ironically this is the same town we stayed at back in 1974 when we made that 21 day, 6,000 mile trip in a Chevy van with all three kids; and we slept in a 10’x10’ canvas tent every night. A lot more luxurious traveling in our trailer this time through. Now, here is where the comedy of errors began. Fortunately the gentleman that owned the campground had a wrench large enough to tighten the hitch ball nut. Unfortunately as I left the campground the next morning I forgot about the wrench that I use to raise and lower the stabilizing jacks was laying on the rear bumper of the truck. Somewhere along I-70 there is a very nice Craftsman Speed Wrench with a ¾ inch socket attached. Find it and it is yours. Also noticed a crack in the tub pan of the shower near the drain. Immediately called the Arctic Fox dealer who was very helpful in advising on emergency repairs and starting the ball rolling on a new tub being replaced after we return home. 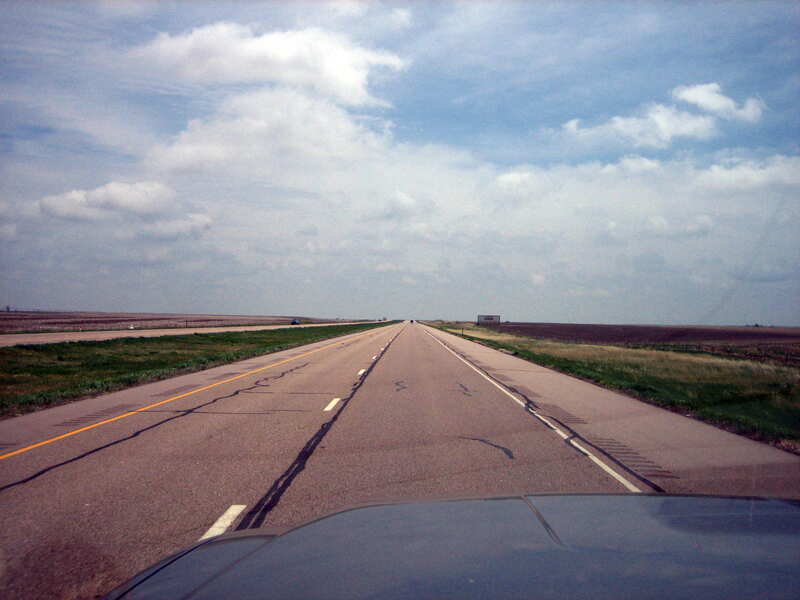 Left the campground early and continued on into Kansas on I-70. This is the view as we entered Kansas. And after 350 miles this was the view we enjoyed. 1. 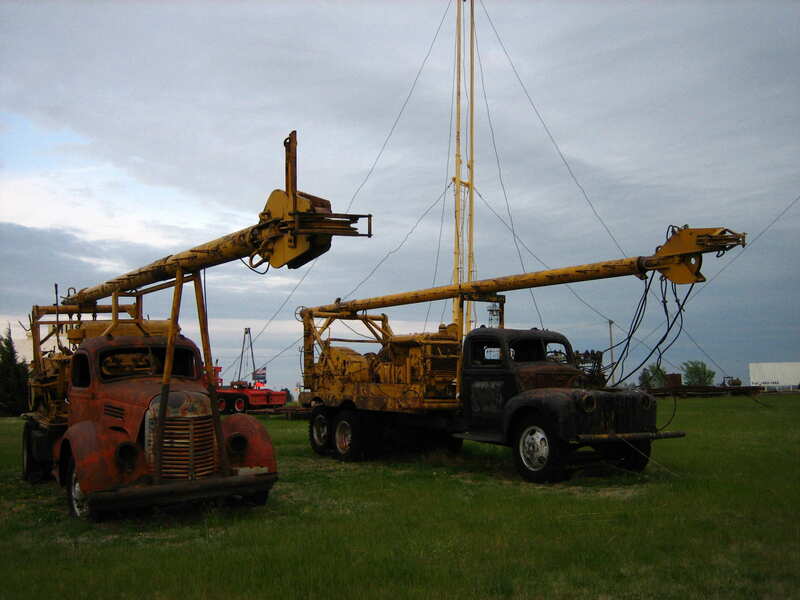 The Walter P. Chrysler boyhood home-might have liked to see that but was concerned they had already started packing everything up in order to ship it over to Turin, Italy…..the new corporate headquarters for Chrysler. 2. 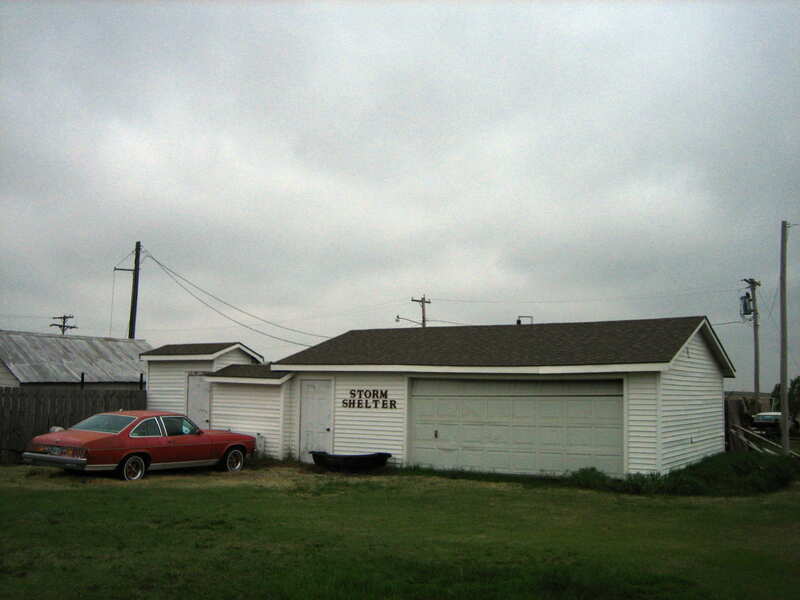 The Bob Dole boyhood home-Not sure why a spokesperson for Viagra is that important but, well….this is Kansas after all. 3. The Alan Specter boyhood home-you know the Republican senator from….what, wait a minute….I just heard over the radio he is a Democrat, again. 5. Miles and miles of miles and miles. So getting bored out of our skulls we decided to get off the Interstate and see some of the back country. We came upon Oil Patch Russell’s Oil Drilling Museum and RV Park. Sounded interesting, it was late, so we stopped. The skies looked kind of threatening…..good thing there is a storm shelter on site. I think that old red car is safer outside in a storm than in the “Storm Shelter”. This entry was posted in 2009 Excellent Adventure and tagged 38. Bookmark the permalink.